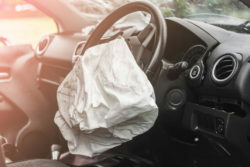 Airbags in vehicles have proven to save countless lives, however when one is deployed during a car accident there are several unwanted outcomes that can take place. From the speed in which the airbag comes out of the dashboard to the chemicals and dust that are released when it is deployed as well as the heat that emits from the bag when it hits your skin airbags have been the cause of several injuries to those who have been involved in a traffic accident. The pros of airbags cannot be pointed out enough, however there are some cons that everyone who drives a car that has one should be aware of. Burns or cuts that are caused by the speed that the airbag was deployed. If you do believe your injuries are due to a malfunctioning airbag it is vital that you do your best to preserve all evidence related to the airbag including all parts related to it such as the crash sensor. In addition, you will want to make sure the car’s computer is not erased and that if the car is severely damaged it is not put in a junkyard or somewhere you will not have access to it. This will not always be easy to do but if you want to prove that the airbag malfunctioned in court access to the vehicle that was damaged is a must. If you can prove that the airbag that deployed was malfunctioning or that it did not operate in the way it was intended you should be able to file a personal injury claim. The fact that you were injured from the airbag does not make anyone liable for your injuries, however a knowledgeable attorney will be able to bring an argument about the product liability if there is proof that the airbag or one of its parts was not designed correctly. If this ends up being the case that means the airbag manufacturer, the automobile manufacturer or whoever was responsible for inspecting or installing the airbag may be held liable for any injuries that have occurred. If you or a loved one were injured by an airbag in an automobile accident you will want a qualified attorney from the Paris Law Firm to stand up for you in court and get you the compensation you deserve. Call us today or contact us via our online contact form to schedule an initial case evaluation.